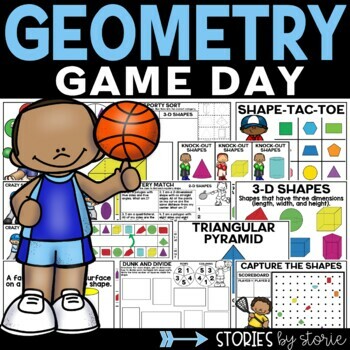 Geometry games and worksheets for 1st and 2nd grade students can be found in this sports-themed pack! Also included are a set of colorful, interactive posters and vocabulary posters. Geometry terminology can vary within different math programs. Some of the games include more than one option to account for these changes in terminology. For example, one game uses the terms 2-D and 3-D shapes while a second copy of the game uses plane shapes and solid figures. 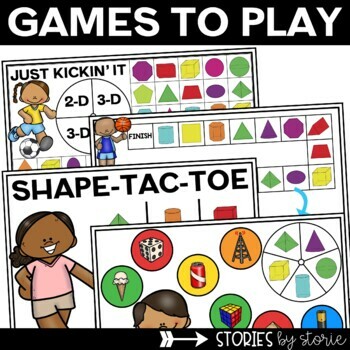 This board game will have your students practicing naming 2-D and 3-D shapes. There are four different versions of this game to choose from (sides, edges, vertices, 2-D vs. 3-D). Students spin and try to be the first to cover four squares in a row, column, diagonal, or square. There are three different versions of this board game (2-D vs. 3-D, edges, angles). Students will spin and move to the nearest square that matches. This game is played like Go Fish. Students must ask for 2-D and 3-D shapes by name in order to find a match. This game is played like Crazy 8s and works with 2-D shapes. This game is played like Memory and works with 3-D shapes. This game is played like Old Maid. Students are matching both 2-D and 3-D shapes to their written names. This game is played like War and works with 3-D shapes. Students spin to determine an attribute (faces, edges, or vertices). Students are comparing two shapes to find the one with the larger number of the attribute on the spinner. Here you will find 13 options for additional practice along with covers to create student booklets. You could use these for independent work, homework, or intervention groups. Four of the pages could be placed into sheet protectors and used over and over with different results. 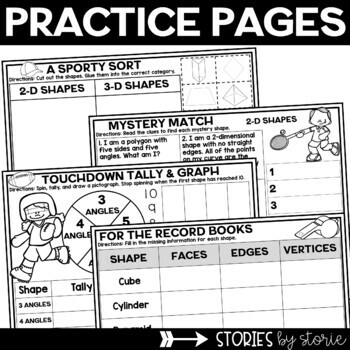 Student pages include identifying shapes, sorts, graphing, fractions, and riddles. There are 2-D and 3-D posters in this section. Some information (# of sides, angles, faces, edges, vertices) has been left blank so students can interact with the posters as shapes are introduced or taught. The shapes include: circle, oval, rectangle, square, triangle, rhombus, trapezoid, parallelogram, octagon, hexagon, pentagon, sphere, hemisphere, cylinder, cube, cone, rectangular prism, triangular pyramid, square pyramid, pentagonal pyramid, hexagonal prism, pentagonal prism, and triangular prism. 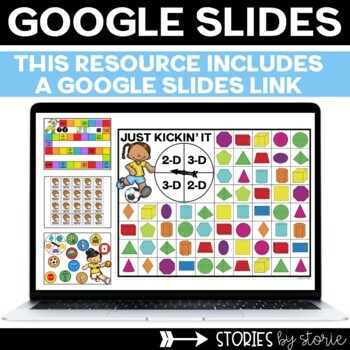 There are vocabulary posters included for 2-D shapes, plane shapes, 3-D shapes, solid figures, angles, faces, flat surfaces, edges, and vertices. Take a look at the preview for more information. Feel free to contact me if you have additional questions.